I have several things I want to work at this year in my crafting. One is to make birthday cards, rather than buy, and another is to enter more sketch challenges. I saw this sketch over at Sketch~N~Scrap and fell in with it. I started searching for my favorite winter scraps, and as I was sorting through I saw my few flower paper items and they called to me. My SIL’s birthday is next month and I thought they would be perfect for a card for her. I think it came out really cute, and I could see using this sketch again and again. Such an adorable card! Love the sentiment! Thanks for playing along with us at Sketch N Scrap! Beautiful card and great sentiment!!! Lovely card and great sentiment! Thank you for joining us at Sketch N Scrap. Such a lovely card. Awesome sentiment.Fantastic job. WTG!!!! Thanks for playing along with us at Sketch N Scrap this month. Love your glittered middle strip and your cute tiny butterflies, nice card ! Thanks for playing along with us at Sketch-N-Scrap ! Thank you so much Solange – I've been waiting for the perfect place to use it! Thank you for looking Kerry, and you're right…who doesn't love some glitter! 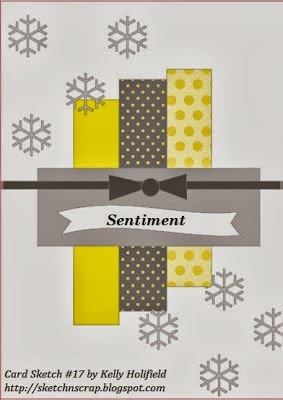 Thank you Brandi – the sentiment is from the CTMH you are my happy set. Thank you Rachelle – it was a great sketch! Super cute. Thanks for participating at Sketch N Scrap. Very cute! Love the soft colors! Thanks for joining us at Sketch N Scrap! Such a great card — love those colors! Thanks for playing along at Sketch 'N Scrap! Very cute! hope she loves it!